Socket Weld Flanges are a device that is welded to the end of the pipe so that the pipe can be bolted to another pipe with a similar flange. Socket weld flanges enable a pipe to be disconnected and reconnected with ease. 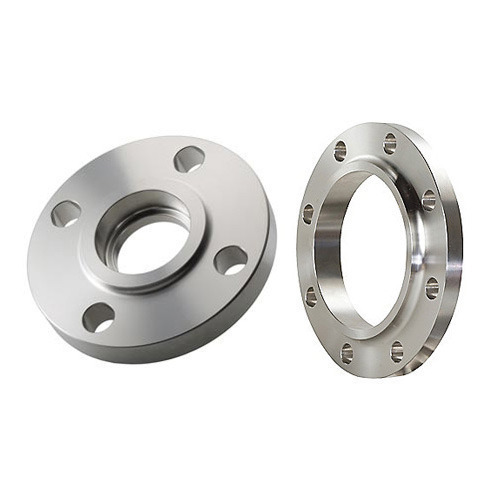 Available in a spectrum of shape and sizes, our forged socket weld flanges are manufactured using superior grade material. Renaissance Fittings Piping Inc is a highly acclaimed manufacturer of Long Radius Bends, Buttweld Fittings, Forged Fittings, Outlets, Flanges, Fasteners, Pipes, Tubes, Sheets, Plates & Coils, Bars & Wires, in materials like Austenitic Steel, Ferrite Steel, Aluminium, Titanium, Duplex, Nickel Alloys, Non Ferrous Metal etc. We design and fabricate these products on the basis of special industrial requirements of our clients. We at Renaissance Fittings & Piping Inc. believe in 'Kaizen', a Japanese principle of quality management which enables us for continuous improvement of our products and services, and hence maintaining Total Quality Management (TQM). With the focus on exports, we have been maintaining a balance between quality of our products and price acclaimed for innovation and market handling techniques. Renaissance is also Stockiest for Aluminium & Titanium materials like Pipes & Tubes, Bars, Sheets, Wire, etc. In order to meet an off-hand requirement of our client, 'Renaissance', keeps a buffer stock of standard items of Pipes, Pipe Fittings, Forged Fittings, Outlets & Flanges from sizes 1/2" to 24". Customers requirements of special items are manufactured with optimum standards in a limited time. We are fully geared with the requisite technical expertise and quality control mechanism, which leads us to successfully meet even the bulk orders of the clients. Additionally, our streamlined administration, regular follow-ups with the clients and quick order dispatch has enabled us to win the faith and trust of the clients. The right product for the right requirement at the right price, i.e. rather than a mere supplier of the product we take utmost efforts in understanding the client's requirement, identifying the right product at the right price. This has resulted in close ties with major customers within India & Worldwide. We are committed to elevating the standards of our products and services to offer customer satisfaction through excellence in quality. Every employee is dedicated toward this aim and every measure and care are taken to ensure production of superior products, quality packaging, timely delivery, competent prices and excellent after-sales service.